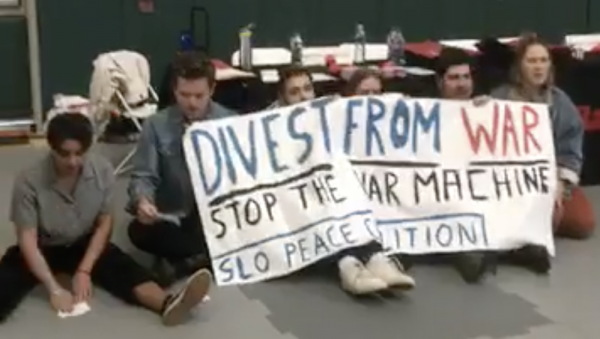 On April 19, students calling themselves the “SLO Peace Coalition” entered the career fair with a banner saying “Divest from war. Stop the war machine.” The career fair was a private event, though Cal Poly students were allowed access. The demonstrators filmed the protest. After protesting for about 20 minutes, they appeared to leave the career fair by their own choosing, rather than being forced out of the building. About two weeks following the demonstration, student protesters received an email from the Cal Poly Office of Student Rights and Responsibilities alleging they violated the university’s student code of conduct, according to a petition launched by the SLO Peace Coalition. The petition says the student protesters were accused of displaying an unpermitted sign and of substantially disrupting university business, and they were threatened with sanctions. The petition demands that Cal Poly drop its investigation into the incident. As of Friday morning, the petition has received more than 600 signatures. “Today, our universities are seeking to punish the speech of peaceful and nonviolent students while allowing the speech of alt-right racists like Milo Yiannopoulos,” the petition states. Additionally, the petition states campus peace activists are scared the university will threaten their futures, and the student protesters are some of the most outstanding members of the Cal Poly community. At least one of the students who took part in the demonstration is a frequent protester who routinely demonstrates on the Cal Poly campus. He has done so over the past four years for and against a variety of causes and as part of various liberal protest groups. Snowflakes, pampered, uneducated and isolated. These are the terms used to describe 6 young individuals that seem to raise the ire of the Regressive Right Cupcakes here on CCN. One poster even goes so far as to suggest by exercising their right(s) it will somehow cost them their freedom. All of these things are asinine, of course, but when a bunch of scared asses get together they of course will feed each others fears while trying unsuccessfully to shut youngsters like this up. Good for them, these youngsters, realizing the undue and biased education their getting based in large part on curriculum that seems to be boardroom approved by corporations rather than put together by educators, they chose to speak out. Raytheon, and other corporations, influence in our secondary education institutions is troubling and seems to grow almost daily. “Hello Dr. Armstrong, this is William H Swanson CEO of Raytheon. If you want another penny for that podunk school you will remove those annoying little snowflakes immediately”. …”Yes, sir, please keep the checks coming. My sincerest apologies”. Uh-oh. There appear to be a few students who don’t buy into the “calpoly is great” dogma force fed to them during their time as calpoly students. Six calpoly students who are able to think for themselves and form their own opinions on relevant issues? Time to beat that out of them. Send in the Jeffrey Armstrong righteous police. They protested for 20 minutes and left leaving no impact on a single person except themselves. Now Cal Poly will have their say about punks disrupting a private even “open” to students. This new wave of protesters have no courage to their beliefs as they read from little notes about what they’re told to be upset about. Toss ’em CP! My take would be that these sheltered little children have not been very well educated. They got a whole lot of learning ahead of them. These kids are going to be so embarrassed when they grow up. What a bunch of naive snowflakes. These kids have lived their whole lives, pampered and isolated from the real world. People who refuse to defend their freedom are sure to lose it. What a load of horse#@$(. Is that what you think our military has been doing, defending your freedom? Do you even know what the word means or are you just throwing out canned phrases. So tired of this cliche’ nonsense from faux conservatives. The military has become a giant welfare program use to protect the interests of American corporations, and not the American people. It is the largest of the tax and spend programs. The reason for the second amendment was because of a fear of standing armies that threaten liberty. The founders thought it better that the citizens protect their own country from invasion. Wake up and learn to speak by forming sentences with your own words.